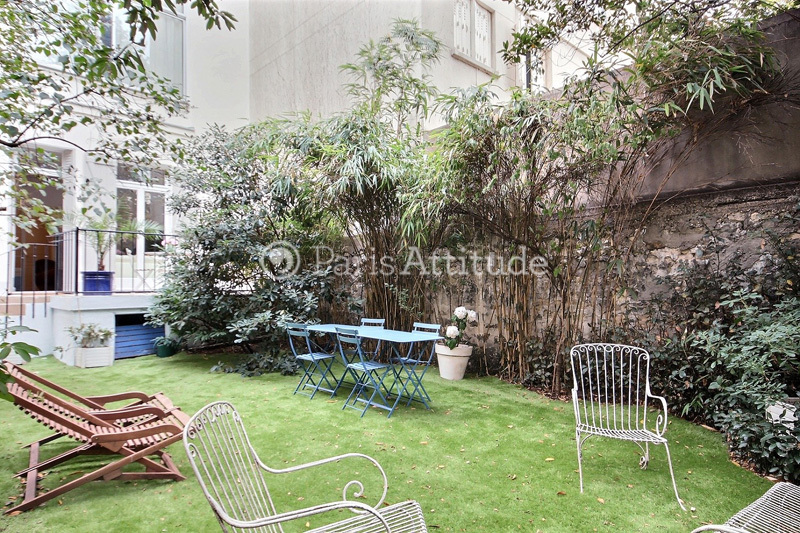 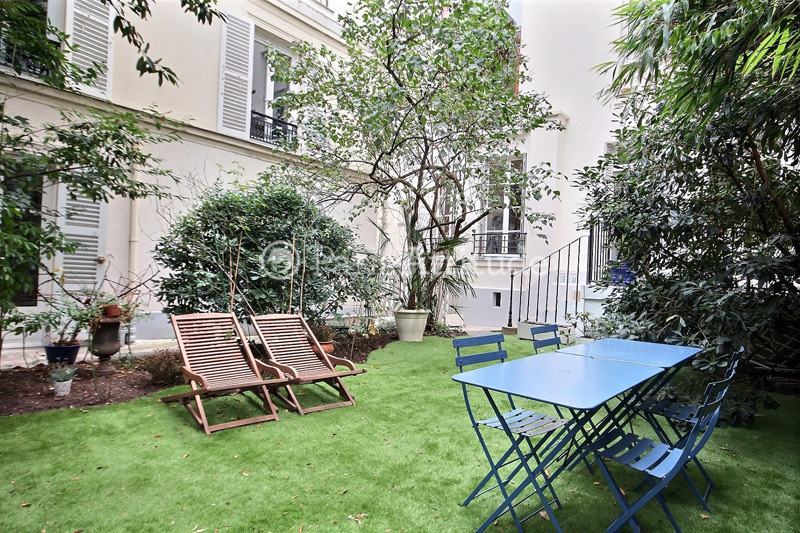 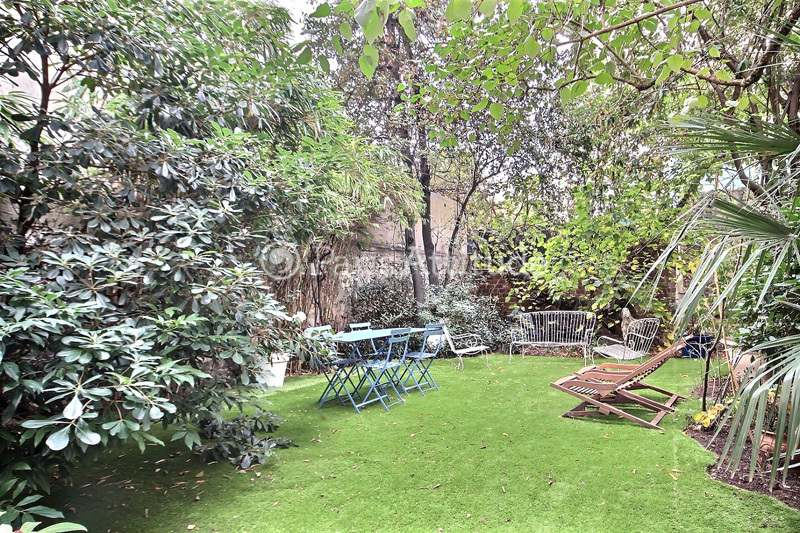 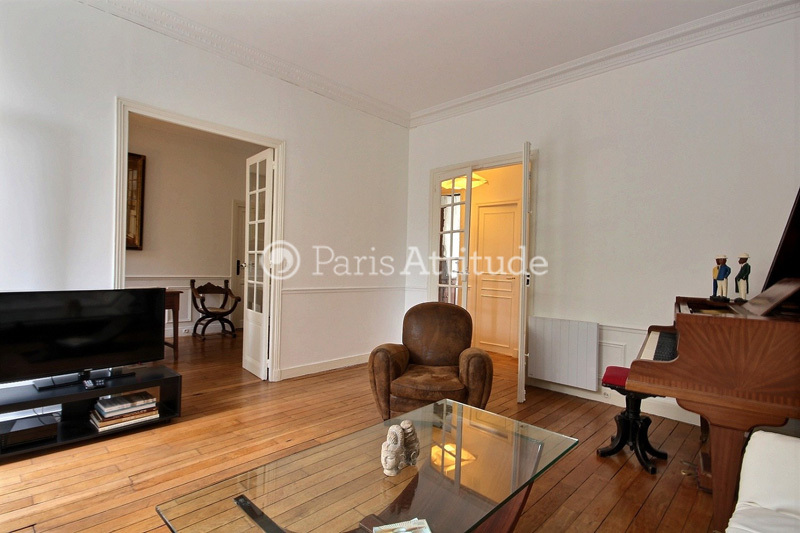 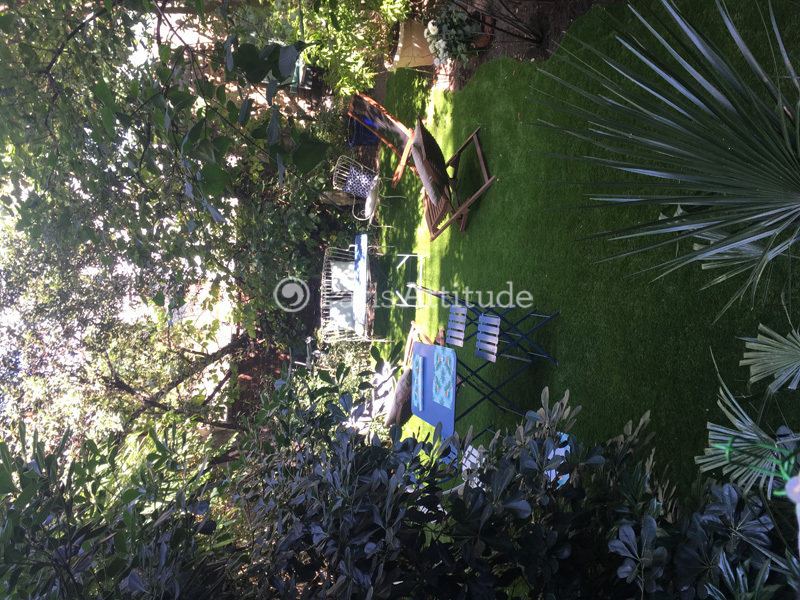 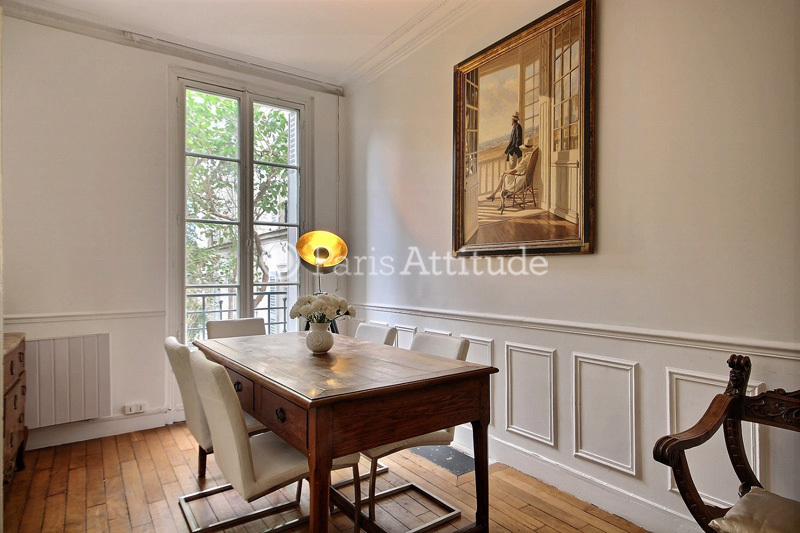 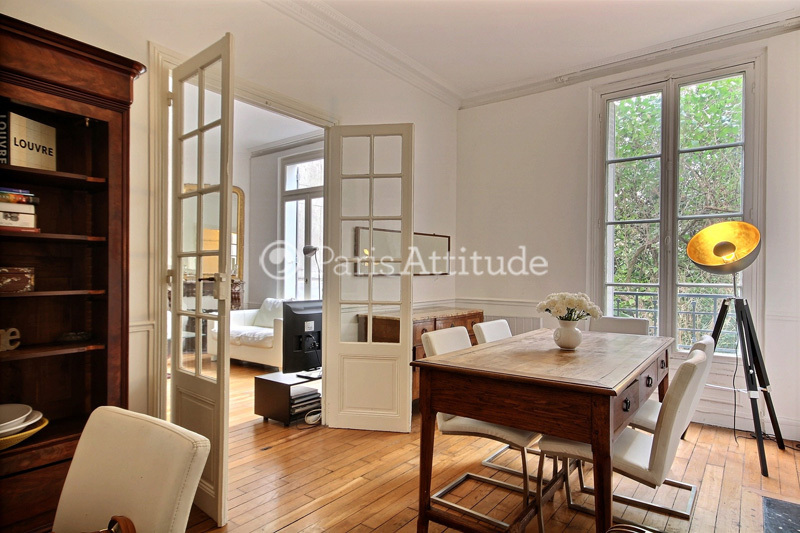 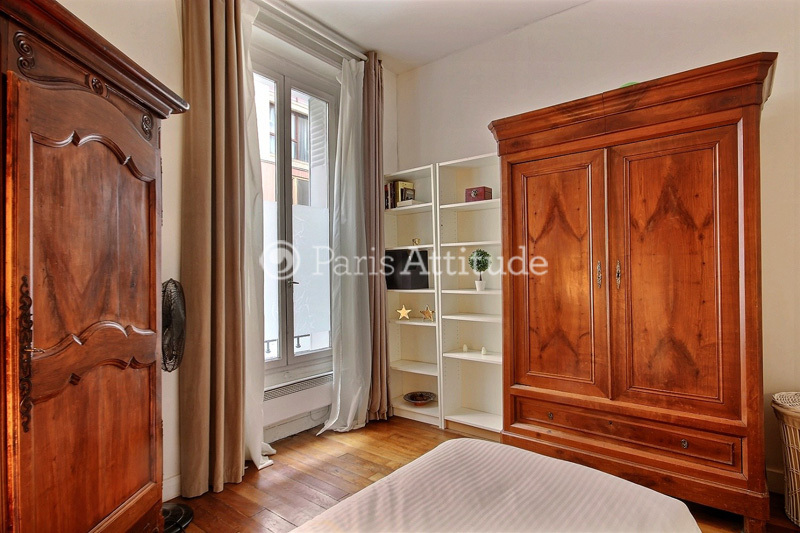 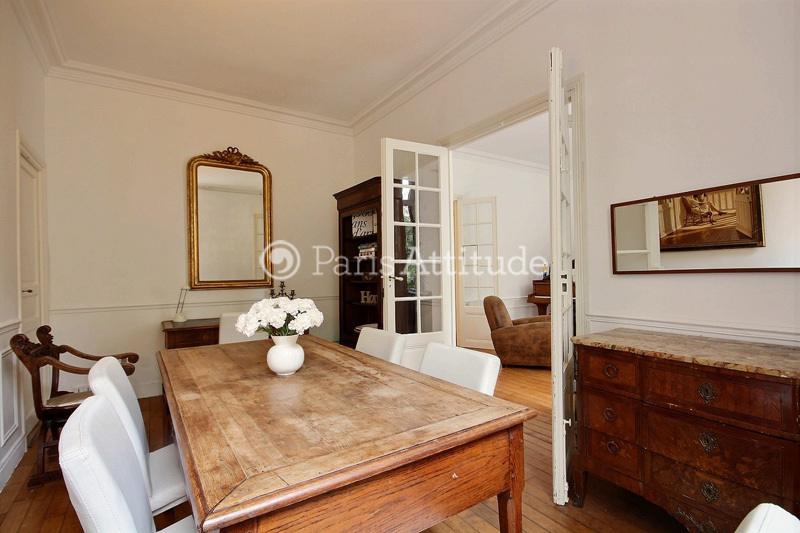 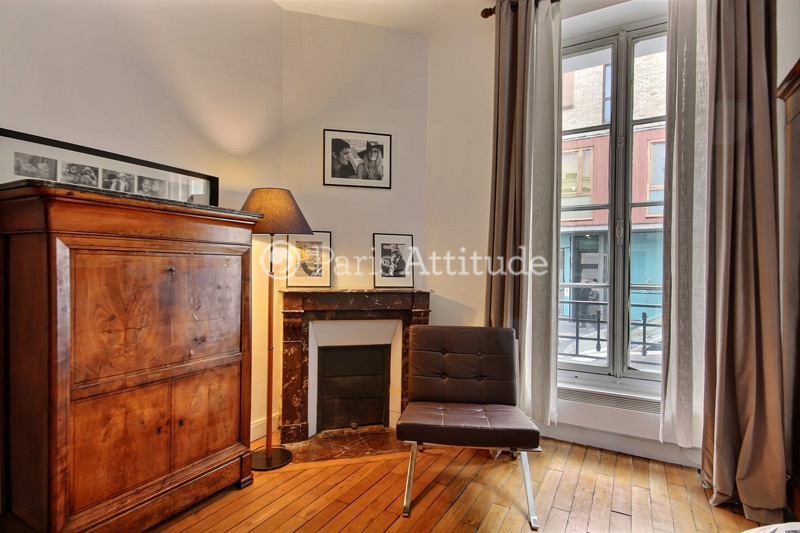 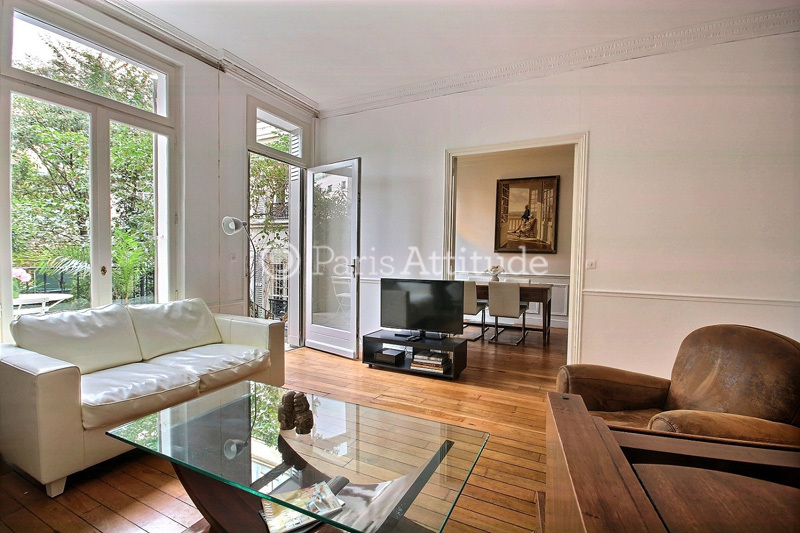 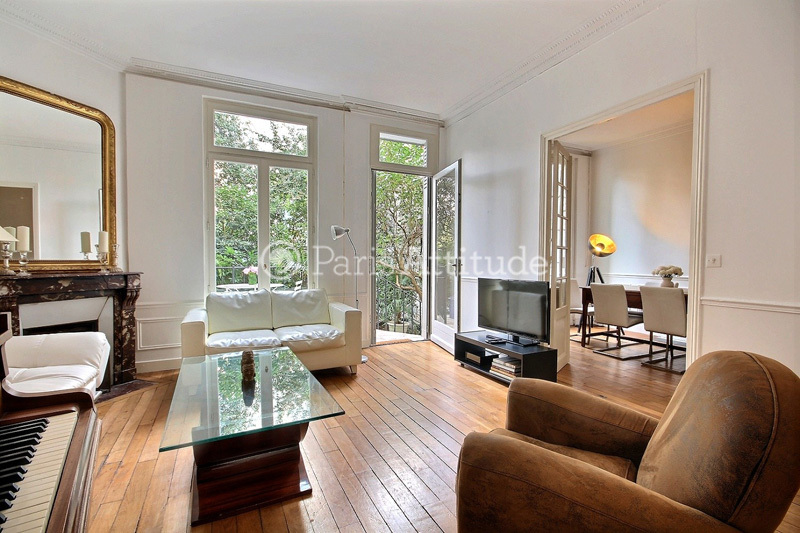 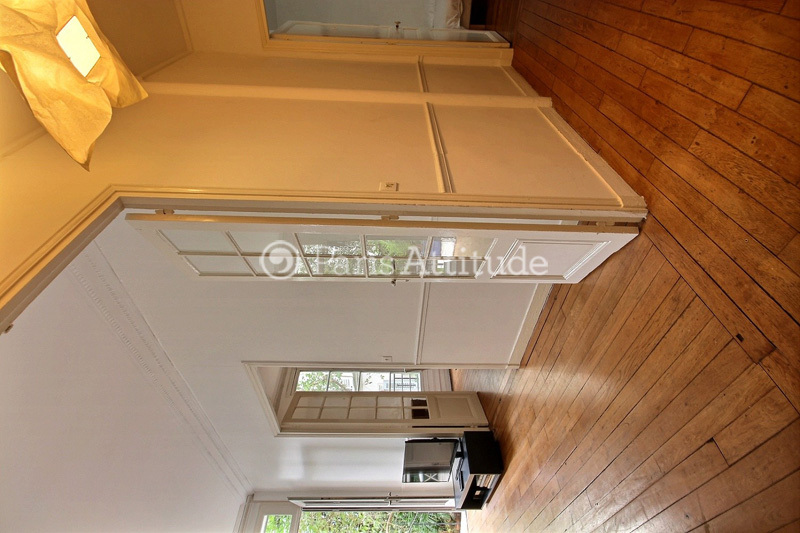 This charming 105 square meters , 3 Bedroom with garden and terrace apartment is located on rue Falguiere in the 15th arrondissement, on the ground floor of a 20th century building and it sleeps 5 people. 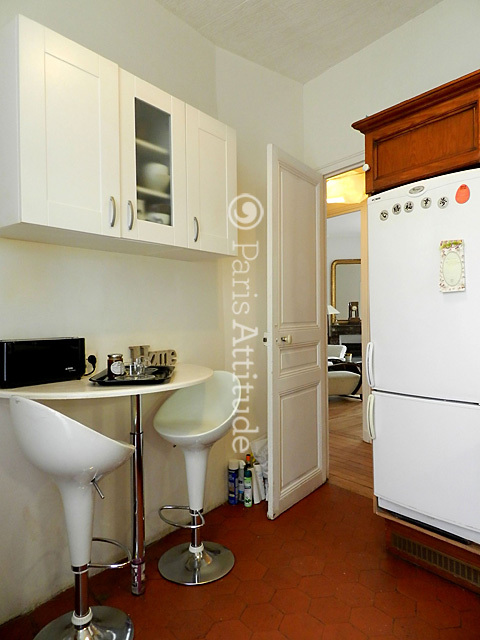 This apartment is equipped with : washer-dryer, cable, TV, unlimited high speed internet access, private garden terrace, DVD, decorative fireplace. 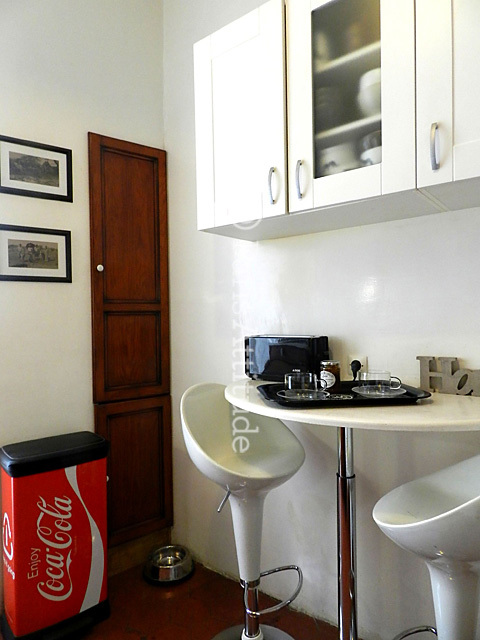 The 20th century building is equipped with : security code. 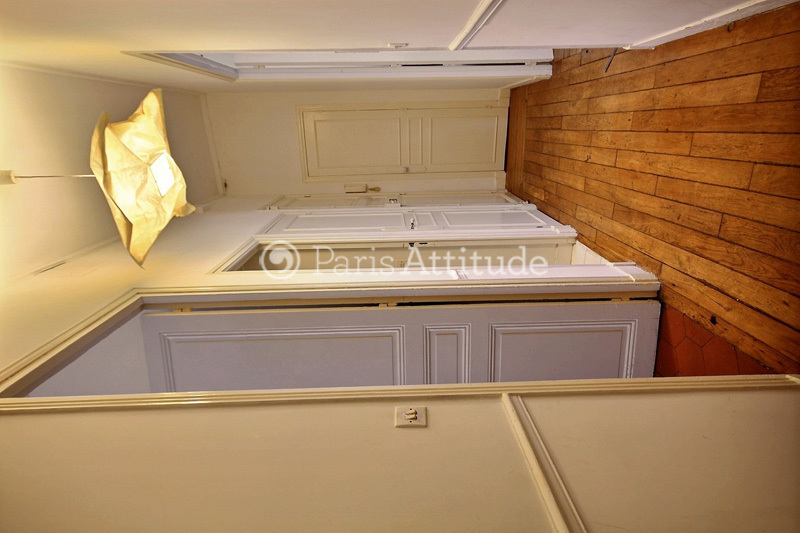 The 10 square meters entrance hall leads directly to the living room, bathroom, kitchen. 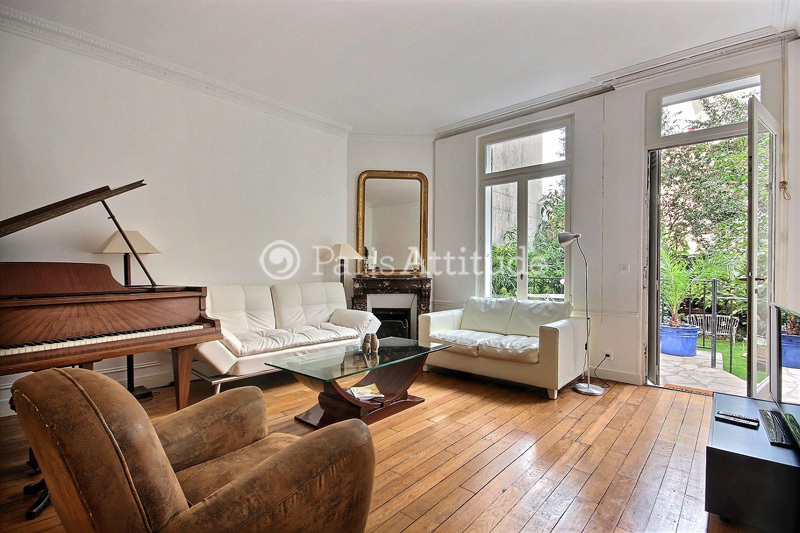 The 23 square meters living room has 2 windows leading to the terrace . 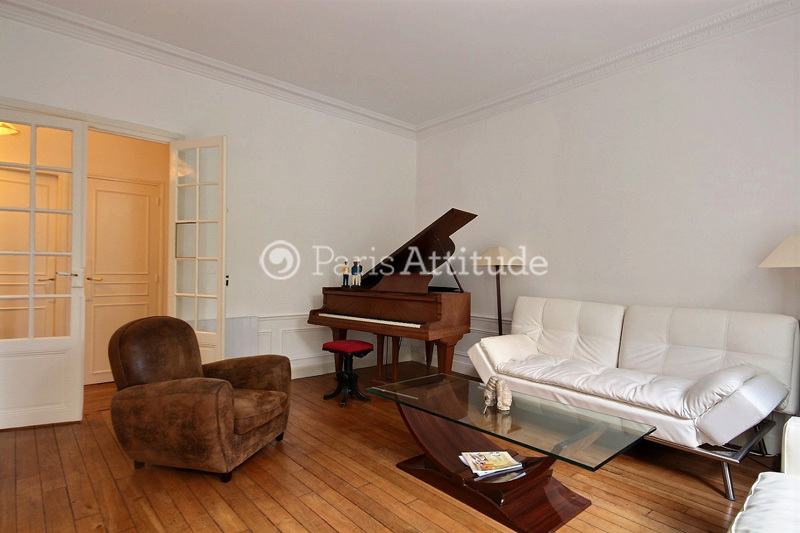 It is equipped with : double sofa bed, coffee table, cable, TV, DVD, 3 armchairs, decorative fireplace, piano, hard wood floor. 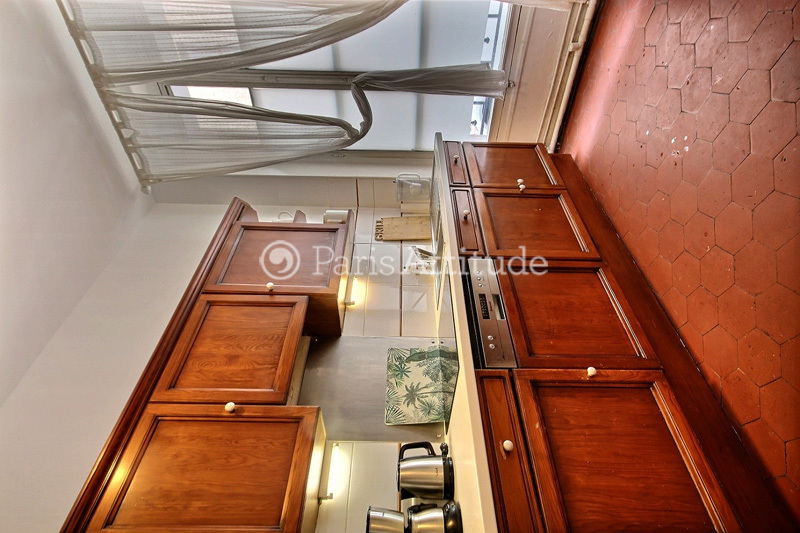 The 7 square meters separated kitchen has a window facing street . 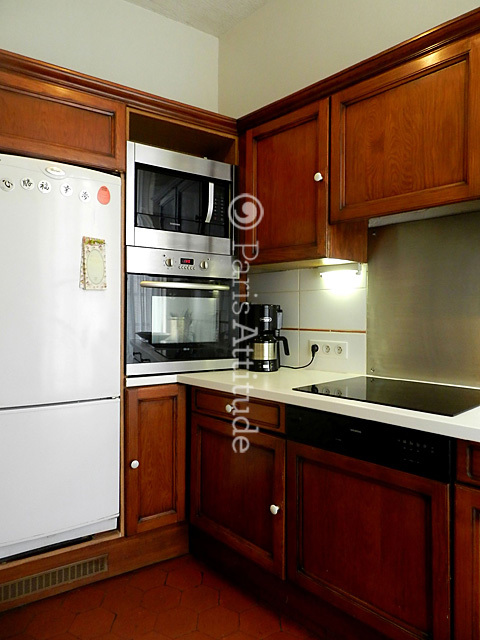 It is equipped with : dining table for 2 people, fridge, freezer, dishwasher, ceramic hob, extractor hood, oven, microwave, coffee maker, kettle, toaster, and all kitchen utensils, hexagonal tiled floor. 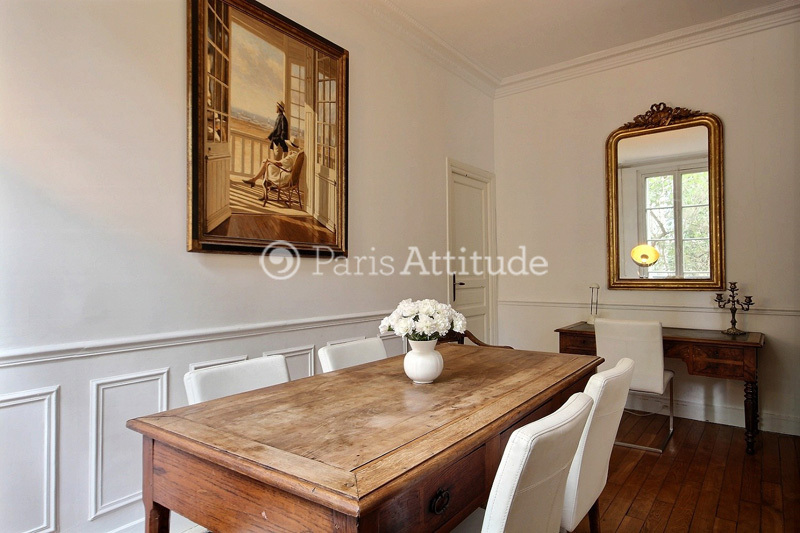 The 14 square meters dining room has a window leading to the terrace and garden . 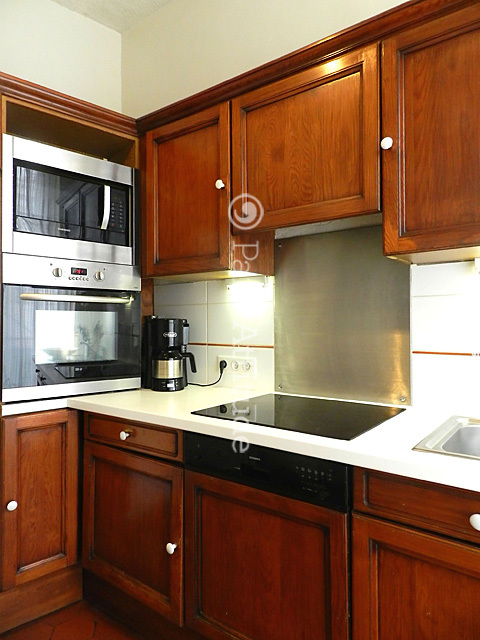 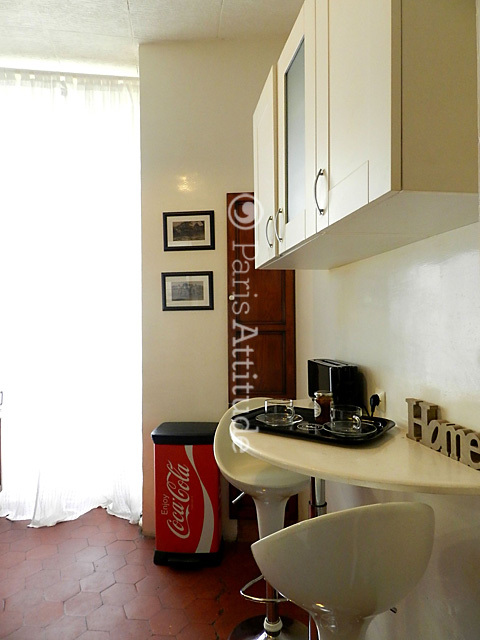 It is equipped with : dining table for 6 people, desk, hard wood floor. 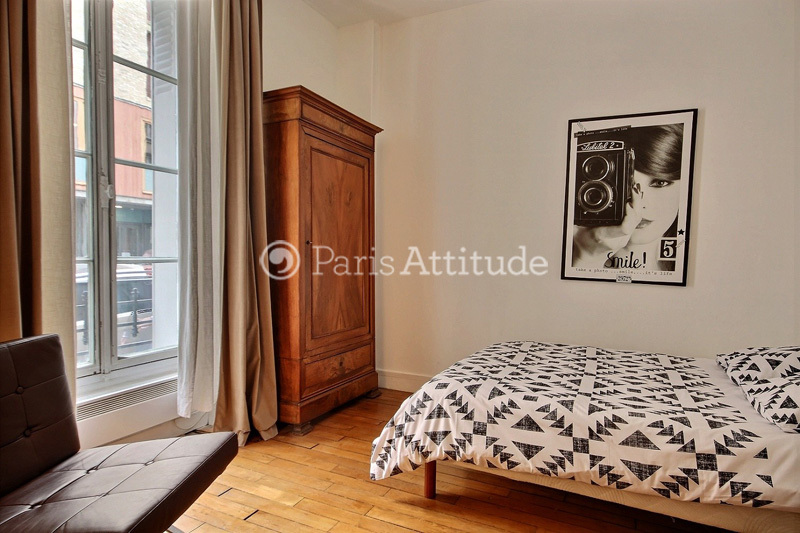 The 13 square meters bedroom has a window facing street . 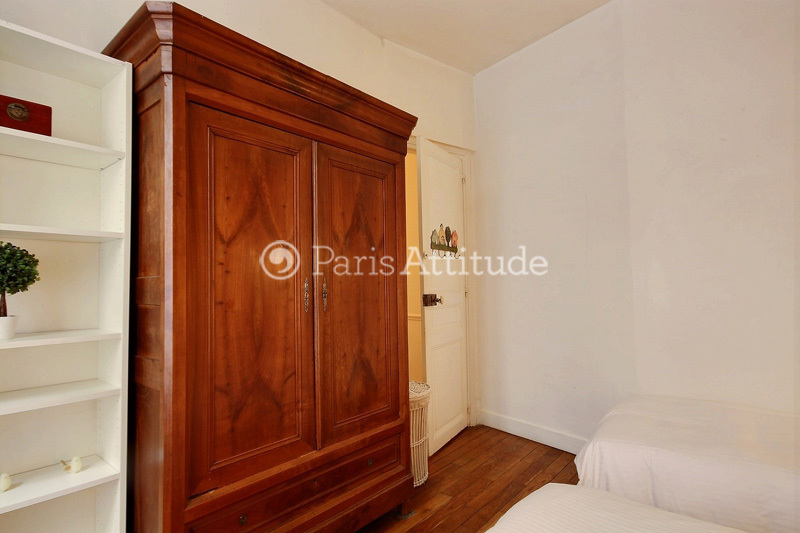 It is equipped with : 2 single beds, wardrobe, hard wood floor. 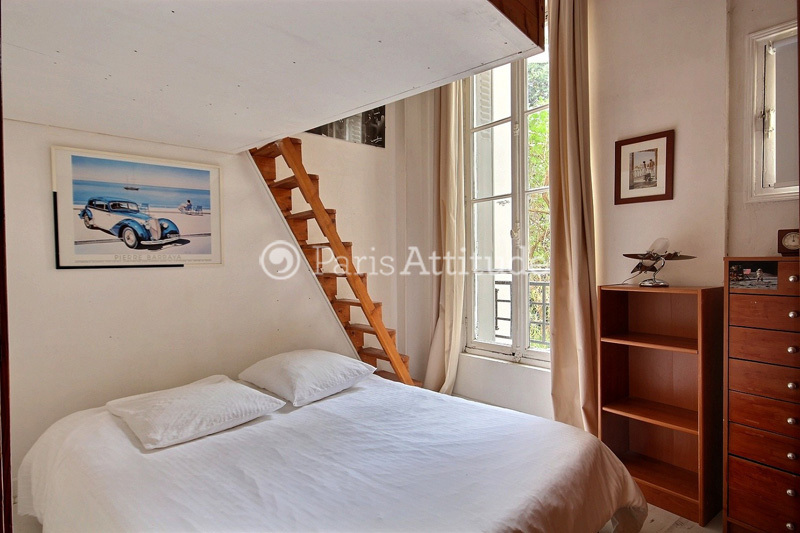 The 12 square meters bedroom has a window facing street . 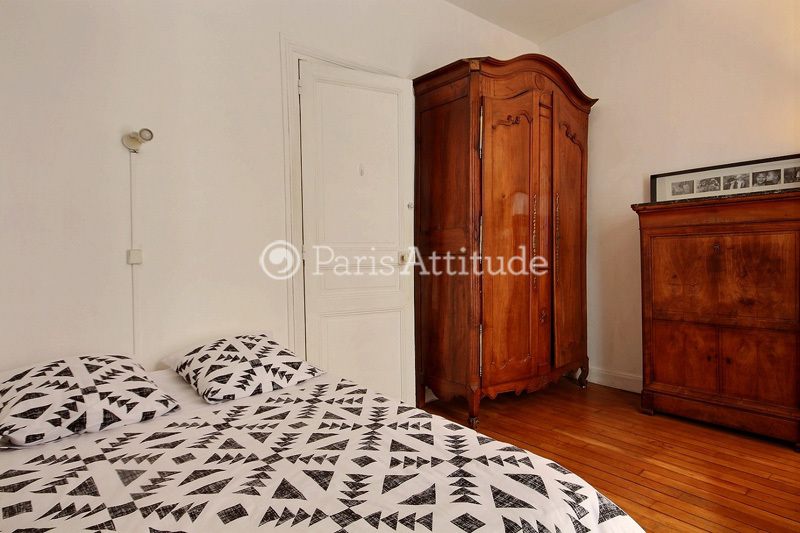 It is equipped with : double bed (1.40m), decorative fireplace, wardrobe, hard wood floor. 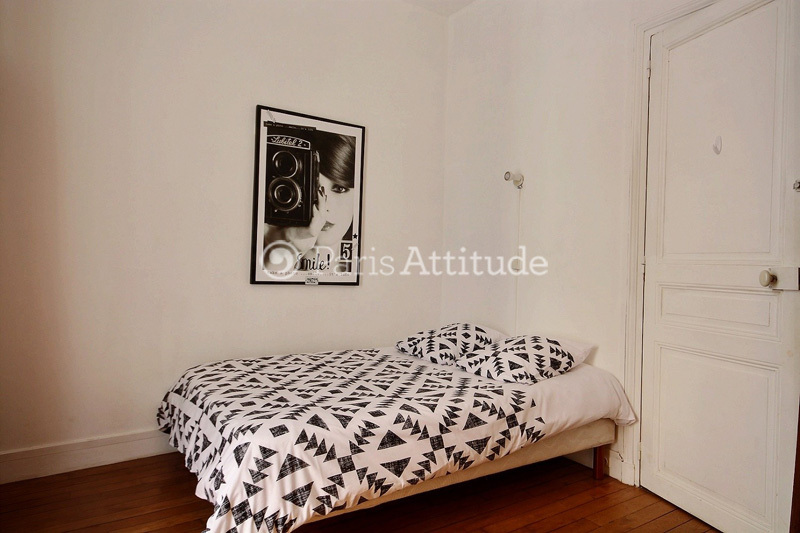 The 8 square meters bedroom has a window facing garden. 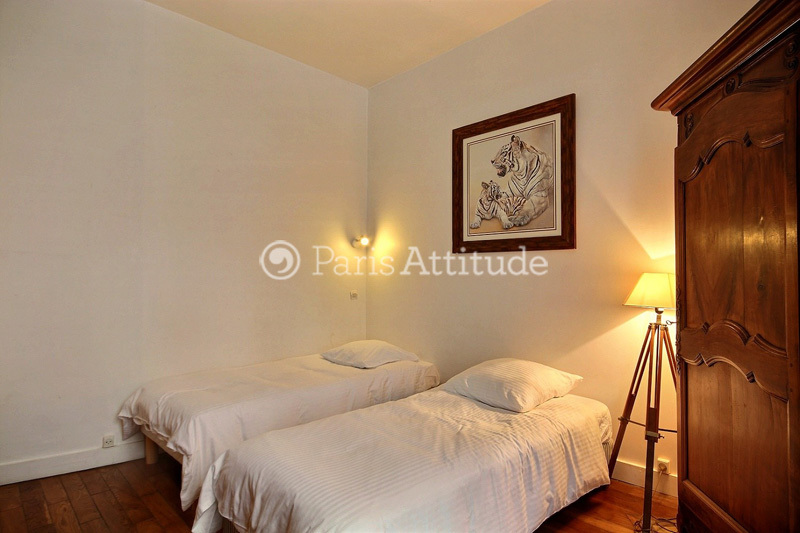 It is equipped with : european queen size bed (1.60m), wardrobe, hard wood floor. 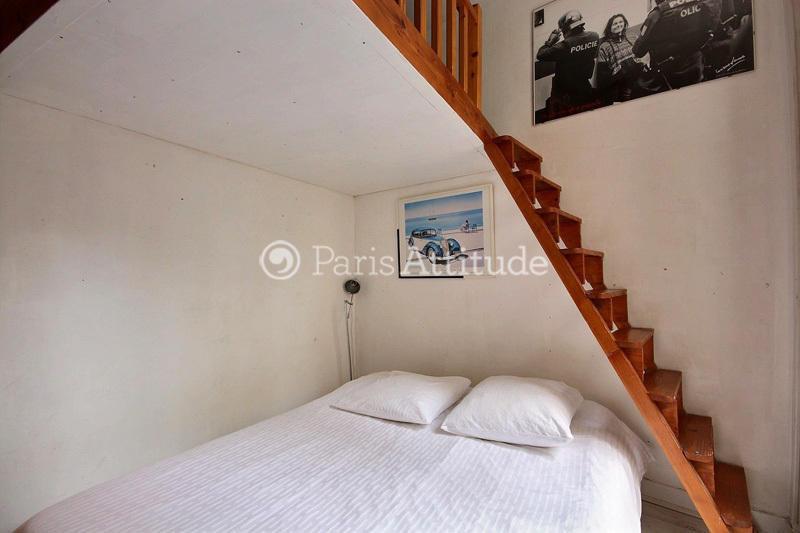 ATTENTION there is no bed on the mezzanine. 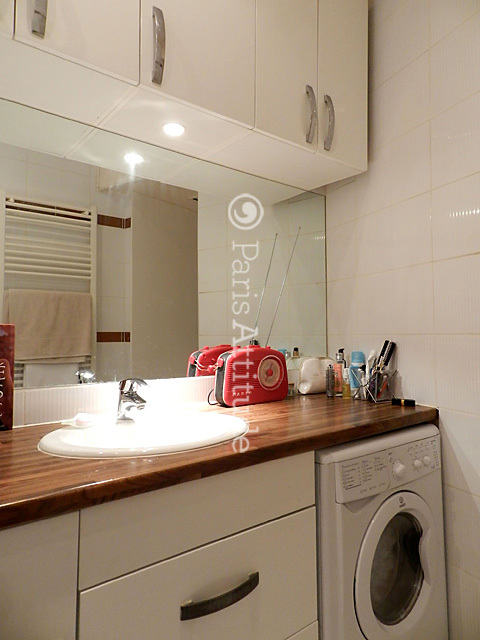 The 5 square meters bathroom has a window facing street . 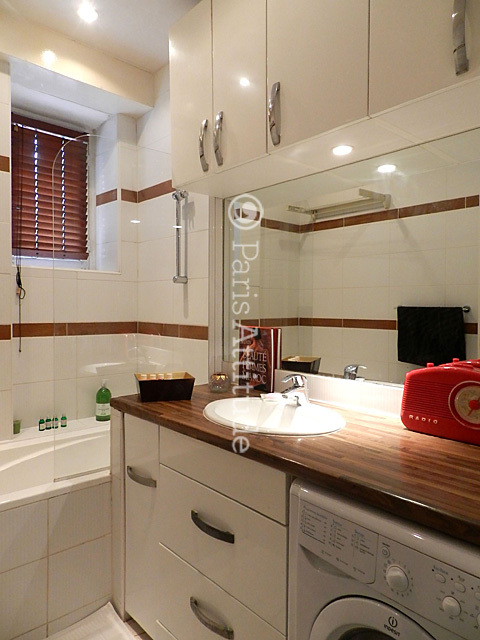 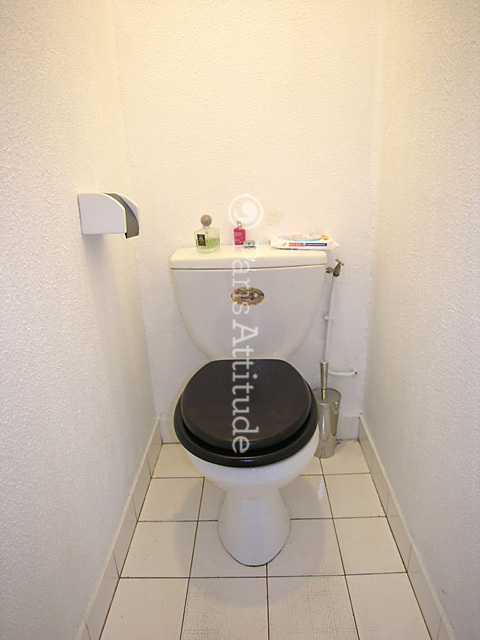 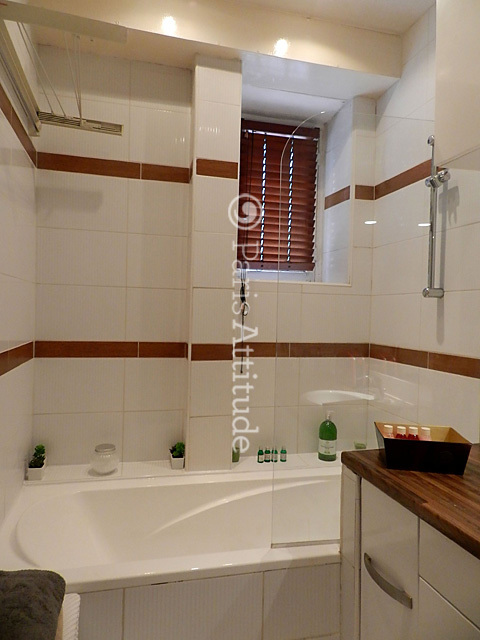 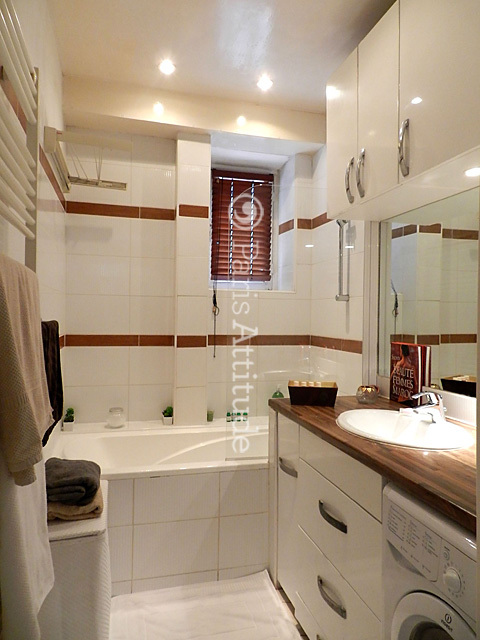 It is equipped with : washbasin, bathtub with showerhead, washer-dryer, tiled floor, 1 separated toilet in the apartment. 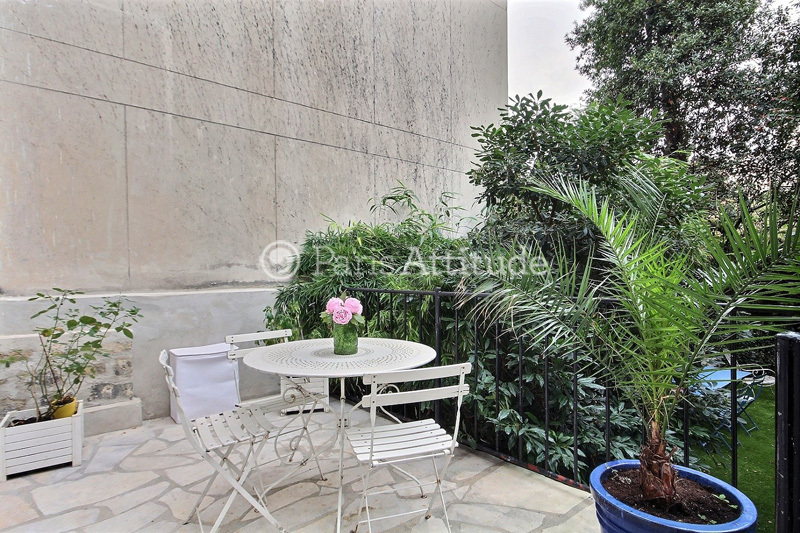 Here is the terrace and the garden of the apartment (120m2).